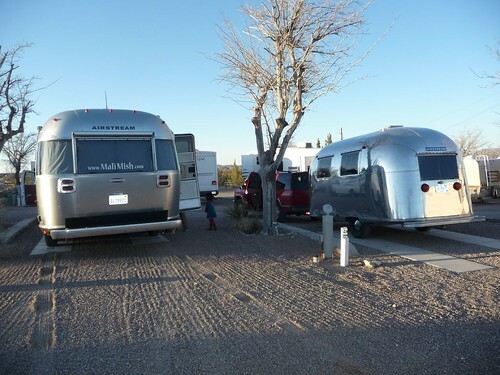 Mali Mish – Day 14: Out of Arizona and into New Mexico. Today is the day. Today is a traveling day and today we are taking Mali Mish further east than we’ve ever been before. 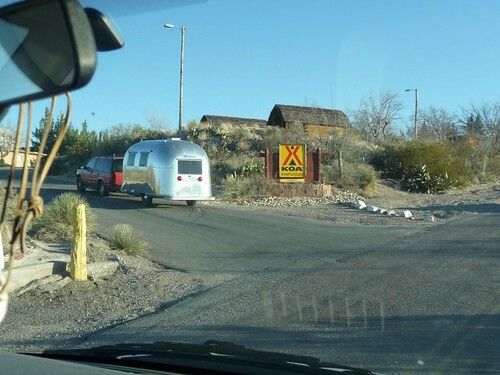 We had stayed in The Shady Dell for 5 nights and this morning we packed up the Airstream and headed back out on the road. After all, we are on this trip to go new places and see new things. 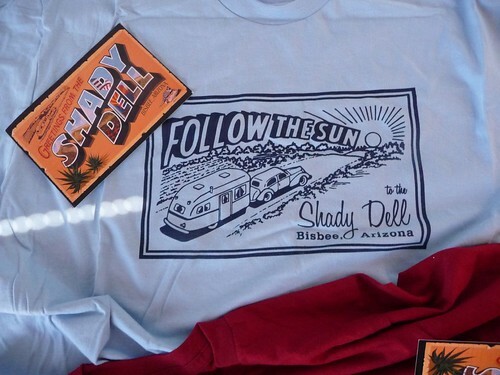 Of course we had to take a souvenir of Shady Dell with us. T-Shirts and post cards will do. Instead of heading north up through Tombstone and back up the I-10 at Benson, we decided to take highway 80 through Douglas near the Mexican border and back up to the 10 freeway on the New Mexico side. 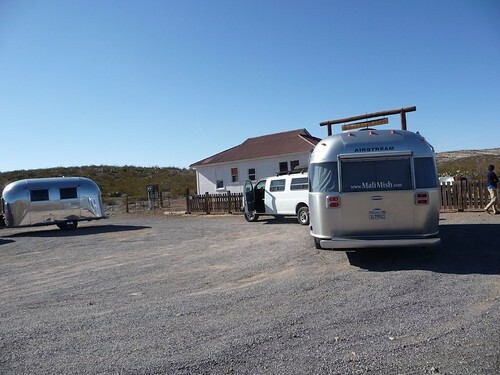 After fueling up at Douglas which is just 20 miles east of Bisbee, we started to the 80-mile drive north towards I-10. This part of Arizona is absolutely beautiful. There are very few cars and the desert just sprawls for miles and miles. As you look around you can just imagine how the Native Americans used to roam the land a little more than a hundred years ago in this part of the country. Not much has changed in this area in those times except the ownership of the land. 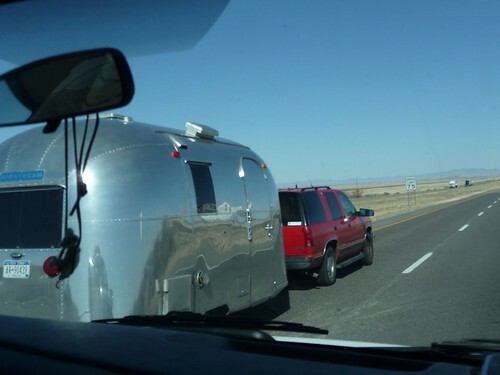 This is our first time caravaning with another Airstream on a road trip. Clair and Daniel’s 17 ft Caravel has such beautiful lines and looks great going down the road being towed by their red suburban formerly used as a fire chief truck. Half way between Douglas and I-10 on highway 80, we had planned on stopping for lunch at a spot we saw on the map. It is the Geronimo Surrender Monument. 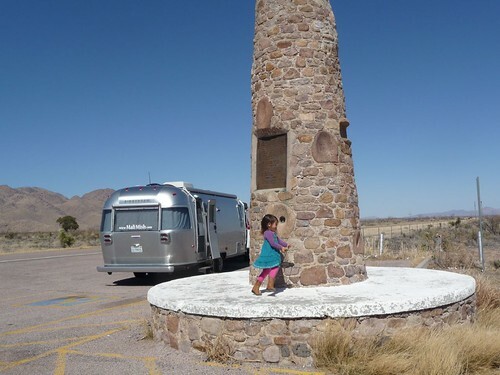 Supposedly it is the place where the famed Apache Chief finally surrendered to the U.S. Cavalry along with some of his followers after days of relentless pursuit. This spot is just off the side of the road in what is called Skeleton Canyon. It has nothing much but a small monument next to a shaded picnic table. The weather has been amazing since we left Tucson and today we are looking at beautiful clear skies with not much wind and about 70 degrees in the eastern Arizona desert. Before we reconnect with I-10, we cross the Arizona – New Mexico border on highway 80. It follows along the border going north for awhile before finally turning northeast into New Mexico. 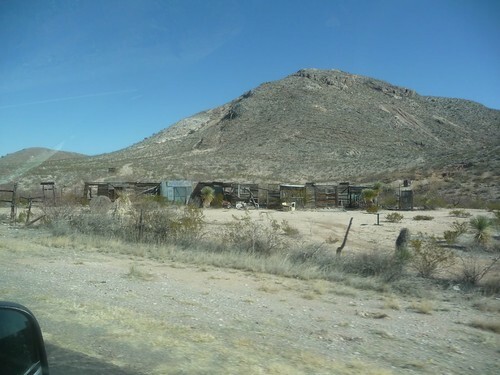 We saw a small abandoned ghost town to the right of the highway just as we are headed up the road. Sadly, we didn’t have time to stop so we are going to have to make it back here and check it out if we are ever in the area again. If you know of any interesting stories about this place, please leave a comment or shoot us an Email. For the first half of the drive Mila slept for the most part and Ava watched movies on her DVD player. We enjoyed the quiet part of this drive while it lasted because we know that the second Mila wakes up, we are going to be dealing with one unhappy baby. Mila does not like driving in the car. I think part of it has to do with her sitting in a rear-facing car seat. She is definitely a mama’s girl. For the 5 short months of her life so far, she has not even been more than few feet away from Marlene at any given moment. When Marlene is not in her sight, she really gets upset and eventually becomes inconsolable if we are in this type of situation where Marlene can not leave her seat to go comfort her. Unfortunately, I had to be on a few work-related phone calls and just before one of them, we had an episode of Mila completely breaking down. The sounds of her crying both wears you down mentally and breaks your heart. We wish there is something we can do short of pulling off of the road so she can be held by Marlene but it will only add to her dependency to her. It is the main reason why we prefer to drive at night as she sleeps. 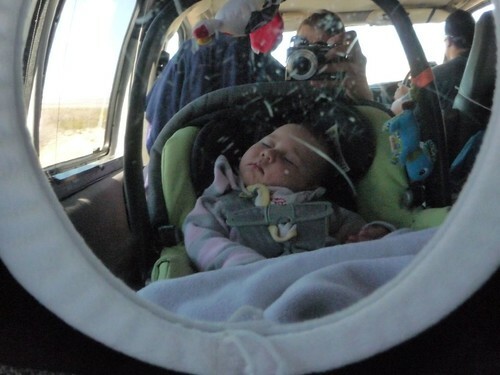 We are able to log hundreds of miles down the road as they both sleep soundly in their car seats. 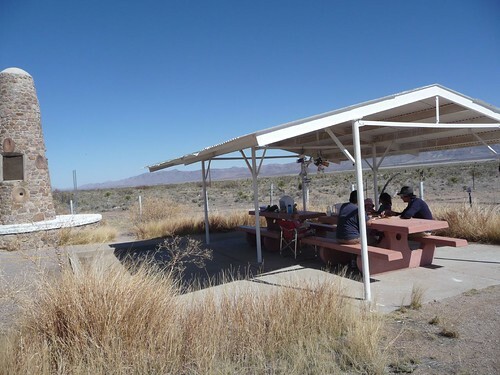 As we got to Lordsburg, New Mexico about 80 miles away from Las Cruces, we pulled off of the freeway to check out another spot on the way to our destination and to give everyone a little break. Shakespeare Ghost Town was recommended in one of Claire’s travel books as a must see sight. A couple of miles down a dirt road we ended up at the ghost town. Unfortunately for us, tours at Shakespeare Ghost Town is by appointment only. When no one answered the phone as we called to try to book at appointment on the spot, we all got back in our rigs and headed towards our final destination for the day. 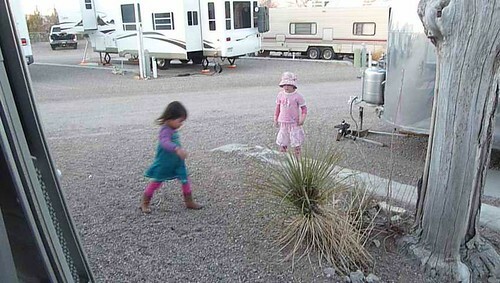 Just a couple miles on the outskirts of Las Cruces, we pulled into KOA Las Cruces, New Mexico. This is the second KOA that we have ever stayed at. The first one was actually on our very first trip in Mali Mish to Lake Isabella. We knew sooner or later we would wind up staying at another KOA so we got ourselves a membership along with a couple nights stay. We are excited to be in New Mexico with our new friends and look forward to spending the next couple days here. There is a lot more to see than we really have time for since Claire and Daniel are having to make their way to Galveston in just another week or 2. Sometime before now and then, we will have to go our merry ways. For now, Ava and Sophia will enjoy each others company for as long as we can travel together. Tomorrow, White Sands National Monument! 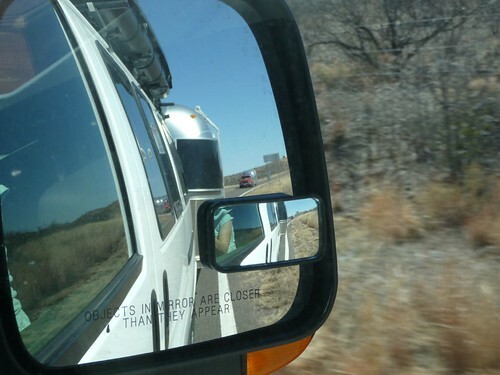 4 Responses to Day 14: Out of Arizona and into New Mexico. after reading this, i just remembered trying to go to that same ghost town in lordsburg, and the same thing happened. it sounds great though. What are the divot marks behind your campsite in your tire tracks? Brakes? Hi Roger, those divots are indeed from my electric brakes. Our brake controller is a time-delay based versus the higher quality inertia based. I need to dial the voltage down when I am going in slow speeds or it likes to lock up the wheels. I must have forgotten to do it this time.